The campaigns are wary about giving specifics, but [..] McCain and Obama campaign strategists have created intelligence reports of sorts on voters, neighborhoods and cities. Using formulas parsing voter history, the kinds of magazines people read, cars they drive, credit cards they own and jobs they hold, they have mapped tossup precincts, tossup homes and tossup voters. They look at neighborhoods, cities and counties that have seen demographic shifts. A Democrat or a Republican who has always been a loyal party voter may get a call from the other side based on where they just moved or a newspaper they just started subscribing to. When local field organizer Christian Lund took the stage just prior to Joe Biden’s appearance on Tuesday night in Marietta, he asked those in the attendant crowd of about 4,000 to look at the sheets in their hands. Each sheet held four names, and each name had a phone number and a bar code for later data scanning. Lund asked the people in the crowd to make four phone calls to this targeted group, and then he demonstrated. The goal is gathering a larger and larger volunteer base. A whole night’s shift of phone calls may seem intimidating to a lot of people, particularly introverts, but it’s pretty hard to say no to four calls. 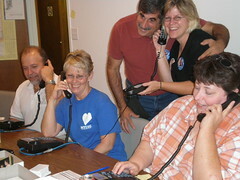 Cleverly, Obama’s campaign reasons that the most difficult part of volunteering is the first four calls or knocks. [..] Once over the comfort threshold, a potential shift volunteer now feels invested in the work. On a walk through a southwest Denver neighborhood last week, Obama volunteer 26-year-old Raj Grewal was having little luck — even at homes with cars in the driveway. Most front porches were cluttered with ballot initiative and U.S. Senate race fliers. A New York corporate lawyer who took a sabbatical to volunteer for Obama in Colorado, he received only one response: A women yelled from the door that she was too busy. A seachange election; people voting for their economic interest over the old culture war divisions. And that in the year that the first African-American presidential candidate is running. Class wins out (even) over race – what more can you say?